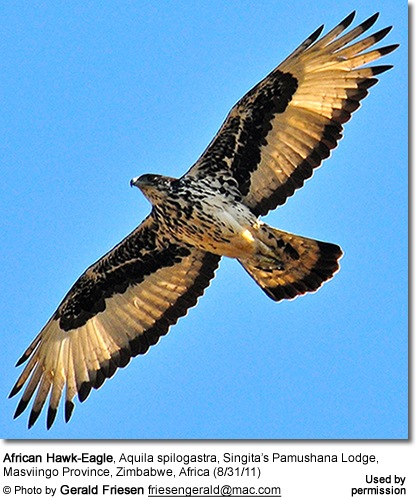 The African Hawk Eagles (Aquila spilogaster) are large birds of prey that occur naturally in tropical Africa south of the Sahara, where they inhabit wooded hills. 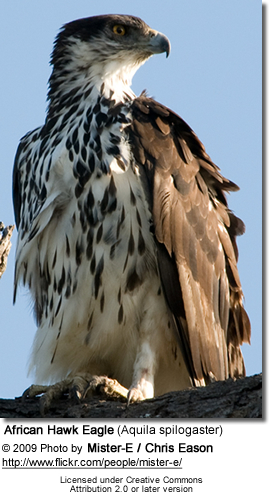 African Hawk Eagles are large eagles that measure about 55 - 65cm in length. The plumage above is blackish. Below they are mostly white, heavily streaked with black. The underwing feathers are white with a black trailing edge. The wings below are blackish with white spots. Males and females look alike, but young birds are brown above and rufous colored below. Their large platform nests are built out of sticks and are about 3 meters in diameter. They are typically placed in the forks of large trees. The average clutch consists of one or two eggs. The African Hawk Eagle prey on small mammals (i.e.. Mongoose and Dassie), reptiles, and birds up to the size of Guineafowl, with Francolins probably making up its main diet. Their vocalizations are described as shrill kluu-kluu-kluu calls.